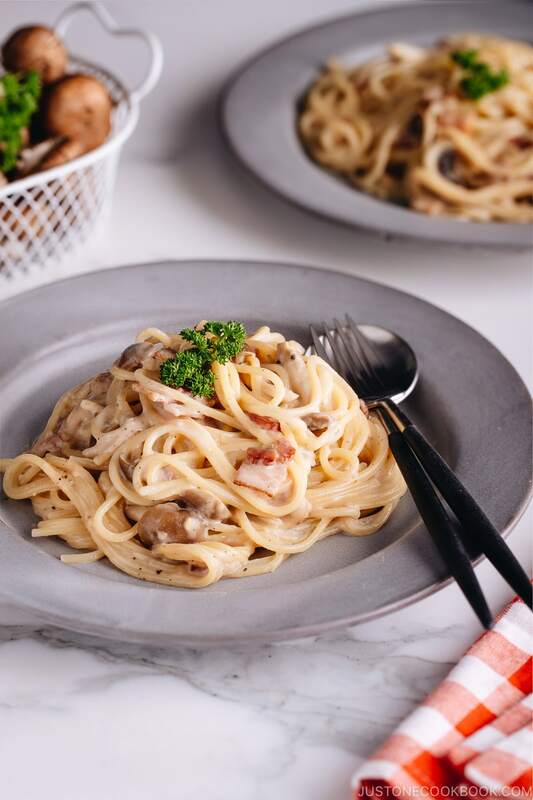 Creamy Mushroom and Bacon Pasta with a Japanese twist! 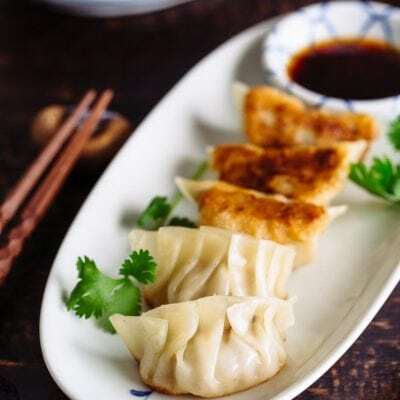 A dash of soy sauce is the secret ingredient that gives nice umami and savoriness to the dish. 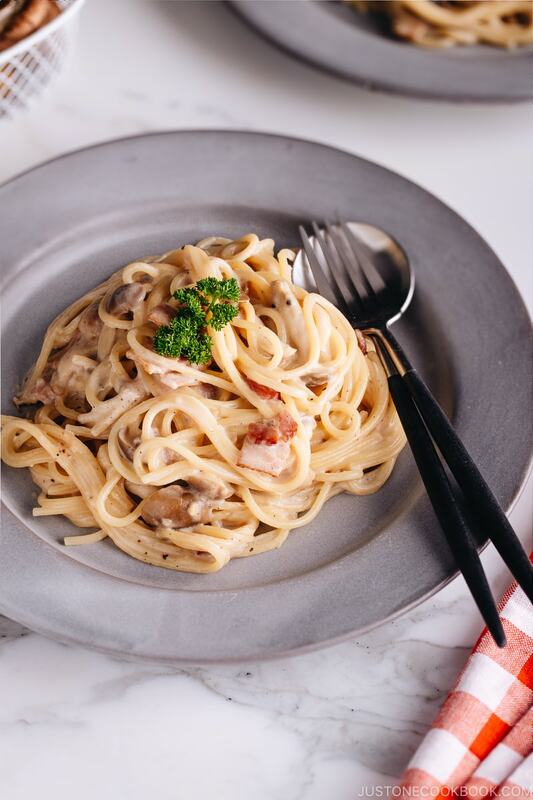 Whether it’s a Monday dinner for the family or a Friday date night, no one can dispute the idea of a rich, comforting and oh-so-good pasta like this Creamy Mushroom and Bacon Pasta. And yes, the Japanese love pasta just like anyone else. 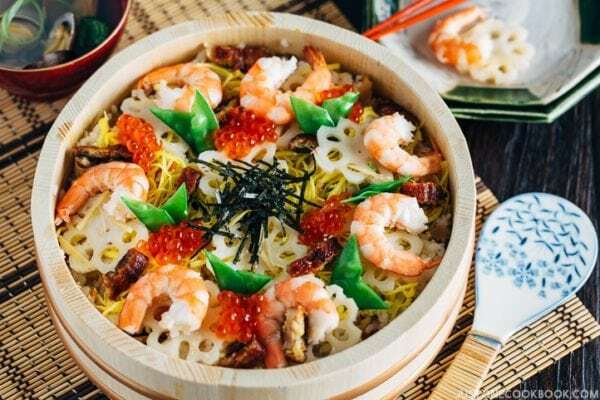 We love noodles and carbs, and we enjoy experimenting with global dishes, giving them some new dimension with our very own Japanese twist. 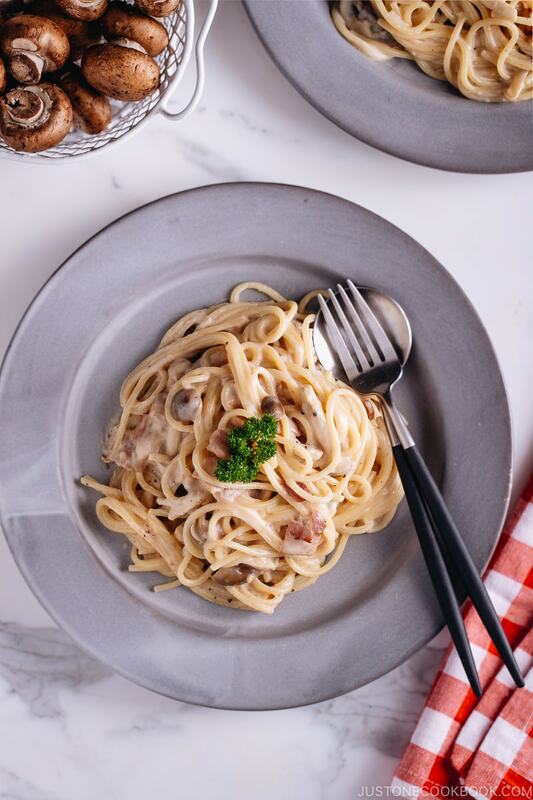 Creamy Mushroom and Bacon Pasta with a Japanese Twist! In Japanese cuisine, there’s a thing calls the Japanese-style pasta or what we call Wafu Pasta (和風パスタ). They are essentially Italian pasta dishes that include a few Japanese condiments, and sometimes Japanese ingredients. 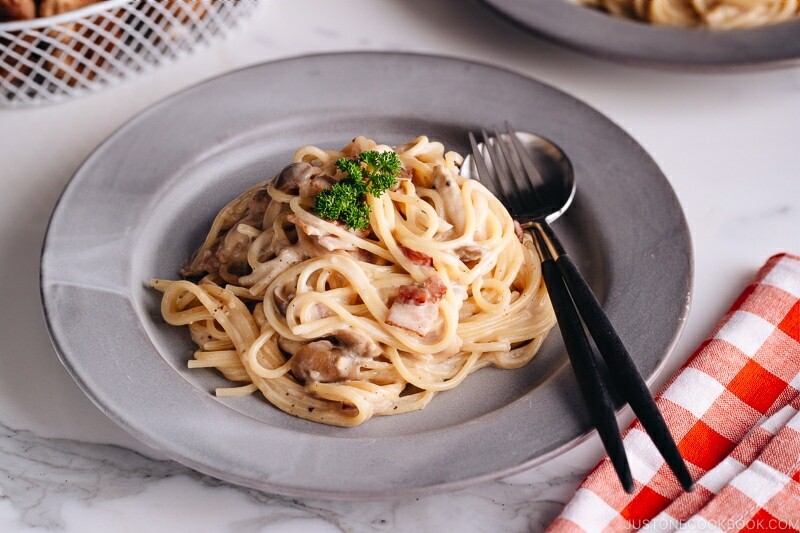 In this Creamy Mushroom and Bacon Pasta, for example, I added shiitake mushrooms and shimeji mushrooms, to give new life to the western-style noodle dish. I also added a splash of soy sauce into the cream. You don’t need a lot of soy sauce here, but just the right amount to lend nice umami, depth, and savoriness. 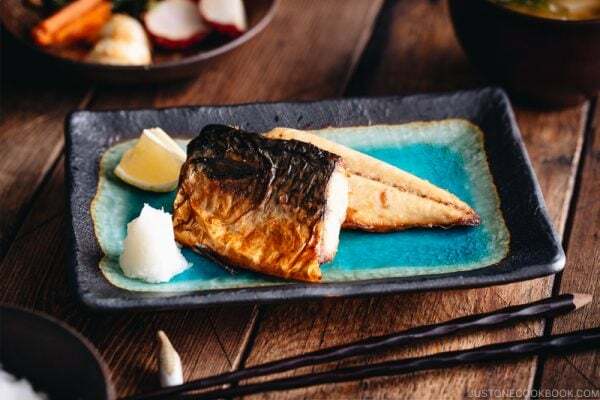 Some other condiments like miso, sake, tonkatsu sauce are also commonly used in western dishes (pasta, soup, main dishes etc). You don’t have to save Japanese condiments for Japanese food. Have fun experimenting! 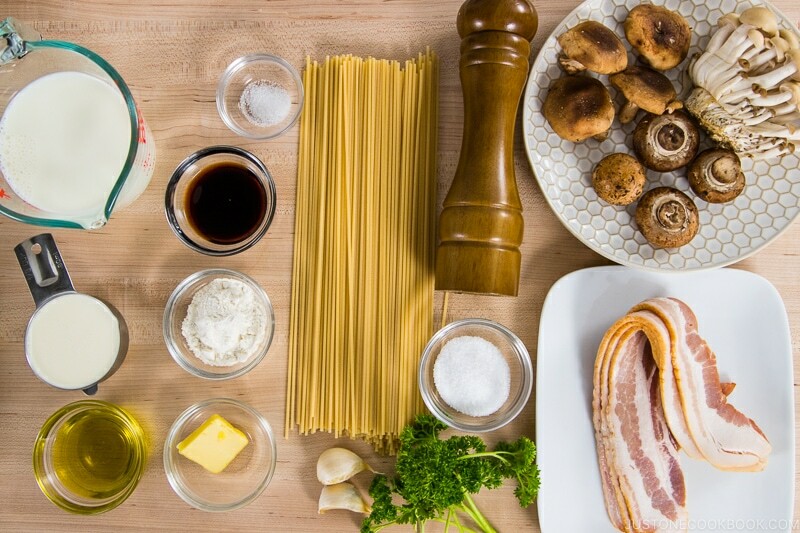 This recipe calls for 4 main ingredients: pasta, bacon, mushroom, and garlic, which are staples in the kitchen. But feel free to replace them with pretty much any other ingredients from your fridge. Here are some of my suggestions that would go with this creamy sauce. Do you have any other good idea? Please share in the comments below! The following tips will apply to the majority of pasta recipes you’ll be cooking. Use 4 quarts (4 L) of water for ½ to 1 lb of pasta. Add 1 ½ tablespoon of kosher salt (if table salt, use half) to the water. Typically, cook 4 oz (113 g, ¼ lb) of dried pasta per person. Cook pasta till al dente; slightly undercooked or “firm to the bite”. Reserve ½ cup (120 ml) pasta cooking water just in case you need to dilute your pasta sauce. 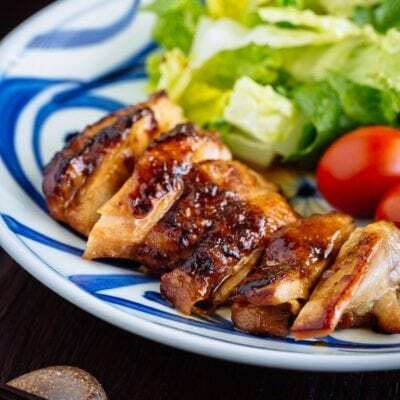 If you have never been to Japan, it’s probably hard to imagine that the Japanese cook and eat western food quite often. In fact, Italian restaurants are everywhere in Japan, and I mean everywhere. At home, we cook all kinds of pasta, some are with a Japanese twist (we call this type “Wafu Pasta” 和風パスタ). 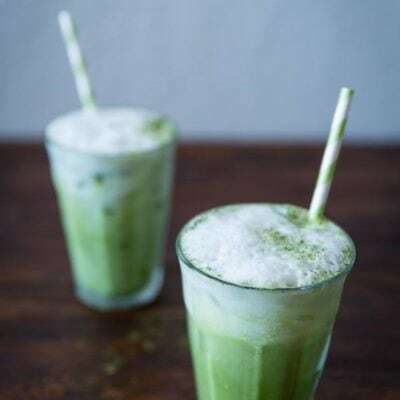 Several years ago I read an article in the San Francisco Chronicle about the growing Japanese influence on San Francisco food (It’s an interesting article to read if you have time). 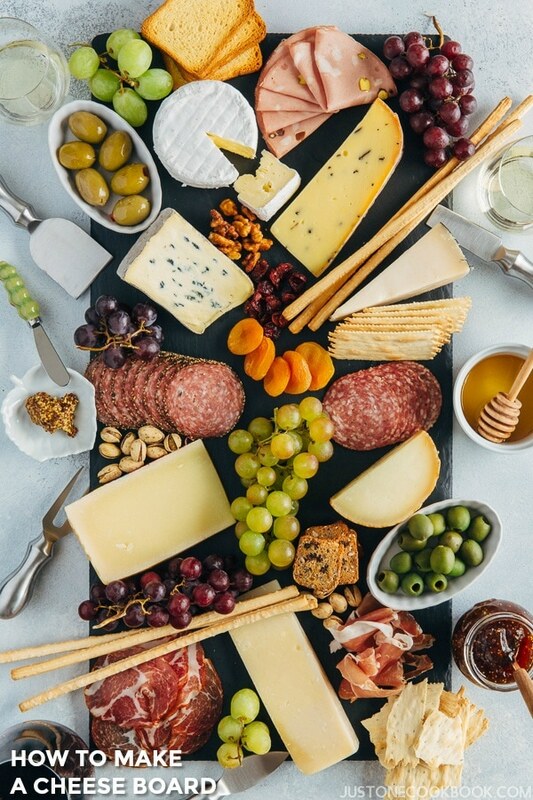 In the article, the editor Michael Bauer mentioned that chef David Kinch at Manresa said, “the best French and Italian restaurants in the world outside of France and Italy are in Japan. 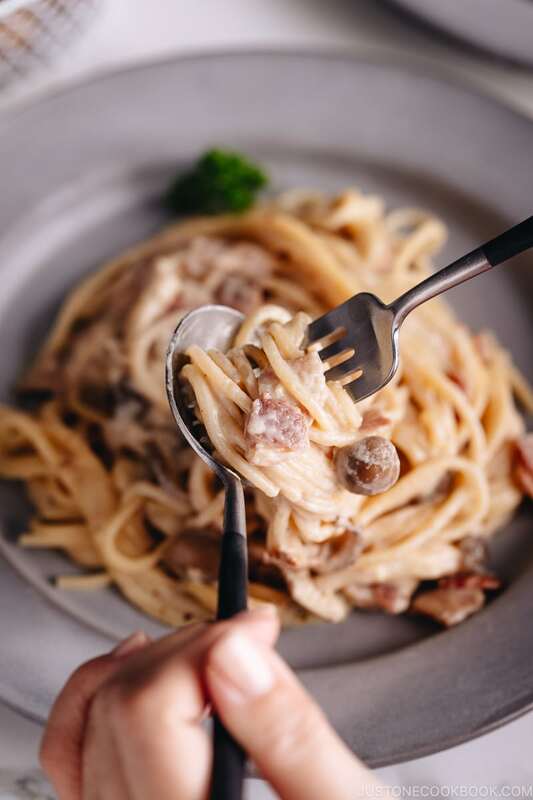 It is that amazing.” My neighborhood Italian restaurants in Yokohama serve superb Italian food compared to the local Italian restaurants here in my neighborhood in the US. When you’re in Japan and got tired of eating Japanese food, try an Italian restaurant and you might be pleasantly surprised! Add 1 ½ Tbsp salt in 4 quarts (4L) of water and bring it to a boil for cooking spaghetti. Meanwhile, prepare the rest of the ingredients. Once water is boiling, add spaghetti and cook according to package instructions. Tip 1: Stop cooking 1 minute earlier as you will continue to cook pasta in the frying pan. Tip 2: Before draining the pasta, reserve ½ cup (120 ml) pasta cooking water. Drain well and set aside. Cut the bacon slices into ½ inch (1.25 cm) pieces. Cut the bottom of the mushrooms and slice them. Cut the bottom end of shimeji mushrooms. Remove the stem of shiitake mushrooms and slice them. In a large frying pan, heat 1 ½ Tbsp olive oil on medium heat. Note: if you use a non-stick frying pan, you can skip the oil. Once the oil is hot, add the bacon and sauté. Once the bacon fat renders, crush 2 cloves garlic and add into the pan. Add all the mushrooms and saute together. Add 1 Tbsp butter and freshly ground black pepper. Add the flour and make sure to keep stirring so the flour doesn’t stick at the bottom of the pan. Stir in 1 cup milk, ⅓ cup heavy cream, and 1 Tbsp soy sauce. Continue scraping off the bottom of the pan. Flour will thicken the sauce. Taste the sauce and add salt and freshly ground black pepper to taste if necessary. If the sauce is too thick, you can add ¼ cup of pasta cooking water (after that, add a tablespoon one at a time) to dilute the sauce. Tip: You want to make sure it tastes a bit stronger than you want the final dish to be (because you will add spaghetti). Add cooked spaghetti in the frying pan, or alternatively, you can pour the sauce over the spaghetti on a serving plate. Using the pair of tongs, coat the spaghetti with the sauce. If you like, add freshly ground black pepper. 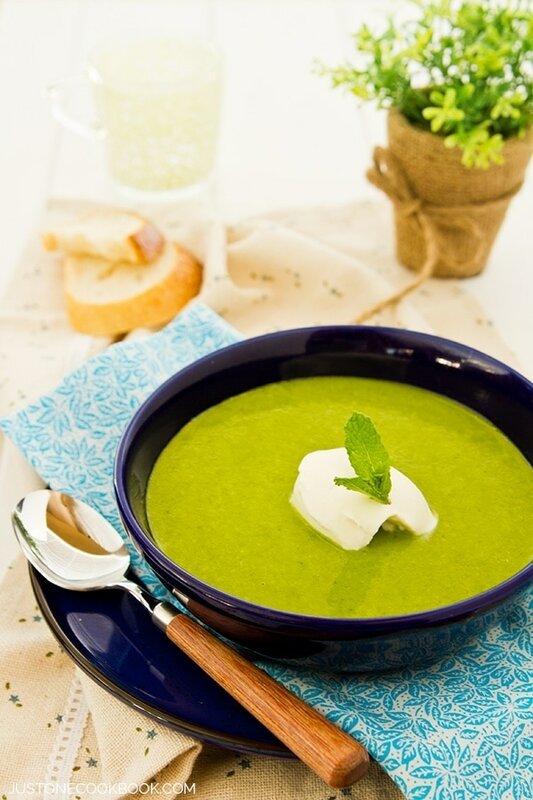 Serve and garnish with parsley. Editor’s Note: This post was originally published on March 9, 2011. It was updated with new images in February 2019. Parsley for garnishDirections:1. Start cooking spaghetti according to package instructions. Prepare the rest of ingredients. You can combine heavy whipping cream and milk in the same measuring cup.2. Meanwhile, in a large skillet heat olive oil on medium heat and cook garlic until fragrant.3. Add bacon and sauté.4. Add the three kinds of mushrooms and mix all together. Sprinkle pepper if you like.5. Stir in flour and keep mixing with wooden spoon. Constantly scrape off the bottom of the pan.6. 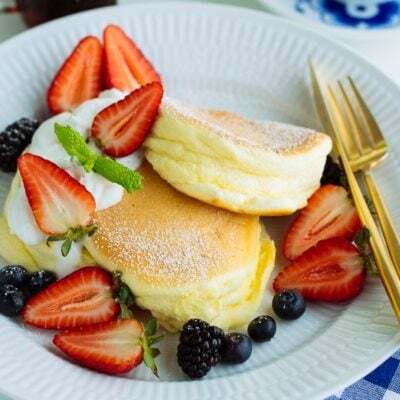 Stir in whipping cream and milk and continue scraping off the bottom of the pan.7. Add bouillon and break it with the wooden spoon. Bring the sauce to a boil.8. When boiling, add soy sauce and mix all together.9. When the sauce gets thicken, add black pepper (and salt) to taste. Bacon is salty so I usually don’t put salt here.10. You can add spaghetti in the skillet to mix with the sauce, or you can pour the sauce over the spaghetti on a serving plate. 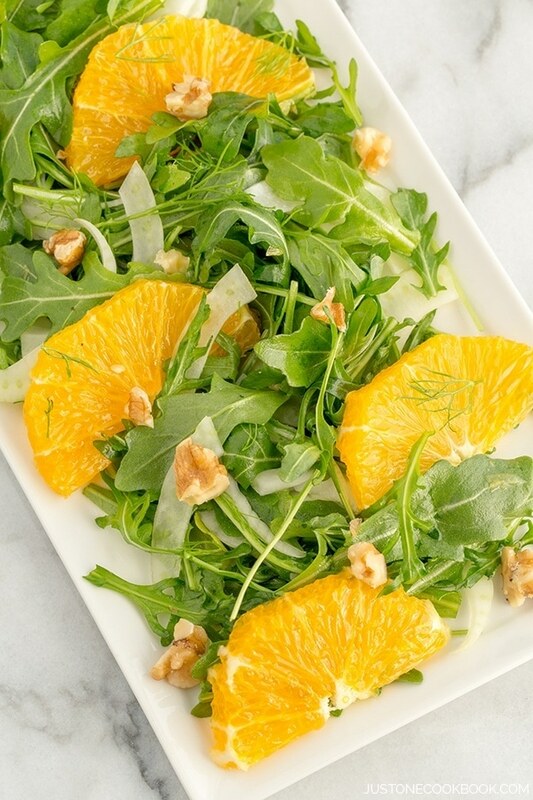 Garnish with parsley and serve immediately. Hi Twinky! Sorry I didn’t realize your comment here. Thank you so much for cooking this pasta! I’m happy you liked it. 🙂 Thank you for leaving comment here, too! ok, will try this possibly with some seafood 🙂 thanks for sharing! Hi Nami, I made this for dinner today for the second time. It’s quite easy and I love mushroom. Thank you for sharing this recipe. I wish to make this spaghetti but I do not like the taste of shiitake. i will just use regular white mushroom unless you can recommend any other type beside shimeji. Will enoki work or is that one for soups only? We have good ️Virginia thick bacon here that I want to use today! I love the pasta in Japan and it is the best I’ve ever tried. I had no idea, what to cook. I had some crimini mushrooms and bacon in the fridge and wondered which cooking blog to search to find a receipe for these ingredients. 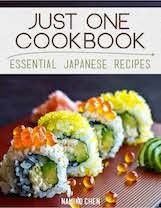 Justonecookbook was all I needed, and the first result was a perfect choice! What a satisfying and tasty dish this is! Thank you so much! Hi Eevamaria! Aww! Thank you for checking my site when you’re not sure what to cook. 😀 I’m so happy you liked this recipe! It’s a super quick and yummy recipe we enjoy too! Hi, I am Ravi from Malaysia. Today my wife and I made this dish for dinner. It was easy to make and very tasty indeed., we replaced bacon with seafood and some vegetables (baby spinach and brocolli). 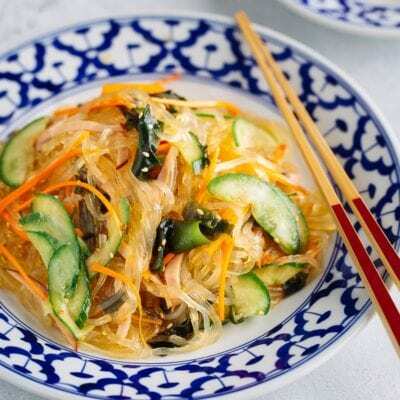 My family enjoyed this dish very much and this recipe is for keeps. We will of course be doing this dish again. Many thanks. I made this dish, this past Saturday. I was really surprised about a Japanese Italian dish. It was delicious!! Thank you for your recipe! Hi Kodi! 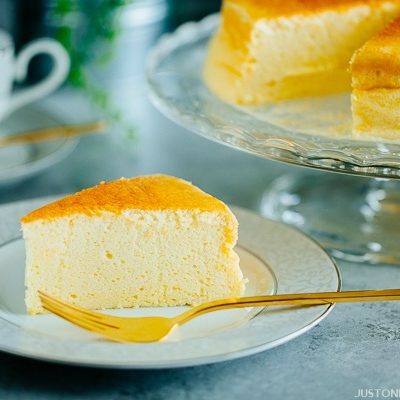 I’m so happy to hear you tried this recipe and enjoyed it. Thank you very much for your kind feedback! A friend gave me a big bag of eryngii mushrooms the other day so I searched your website and made this for dinner tonight. I also used shimeji, shiitake and enoki mushrooms. It was so delicious, especially with the shoyu in there. I will be making this again. Thank you for sharing!! Mahalo, Amy???????????? When I lived in Japan and would eat out, this dish was always included in the pasta section of every menu. Also a staple on every pasta menu was a similar dish, only it was spinach and bacon, with a dashi base sauce (not cream base). 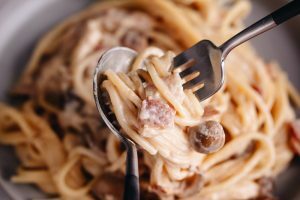 I have always wanted to learn how to make this as it’s my all-time favorite pasta, but I can’t figure it out! When I guess, it just doesn’t taste right. If you could publish this pasta recipe as well, I would be forever grateful! Hi April! So it’s not a creamy one, it’s simple dashi base spinach and bacon pasta. I think it’s a dash of soy sauce. Do you add it? I’ll add to my list. Hopefully I get to try when I go back this summer. I LOVE wafu pasta, but the rest of my family is not a big wafu pasta fan (when they are in Japan, they rather eat other food!) so we rarely go to pasta place… I’ll look into it! Oh Nami – Asian mushrooms and soy sauce are a ‘given’ on most occasions anyways . . . 🙂 ! This is wonderful! 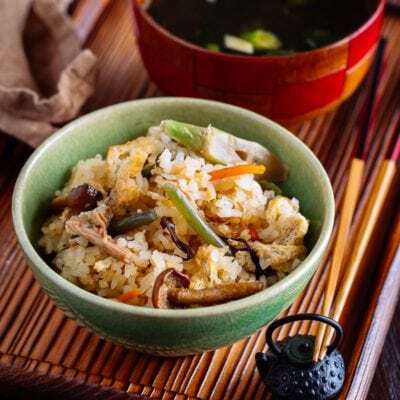 I love the mushrooms of course, but to add a bit of soy sauce is such a novel idea to me! Can’t wait to try it. 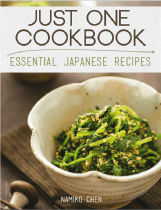 I am a third generation Japanese Canadian and I have been using your recipes to learn how to cook dishes my mother used to make. 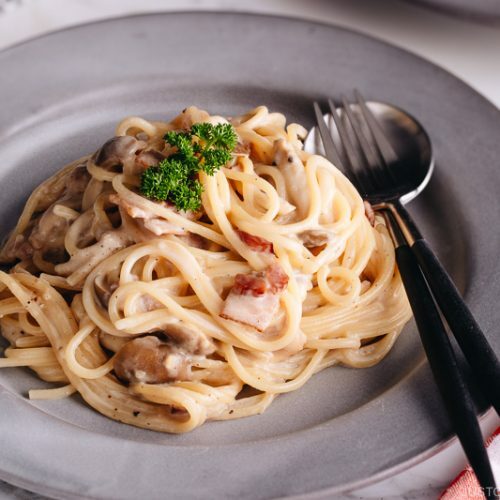 Recently I tried your bacon and mushroom pasta and it was delicious! 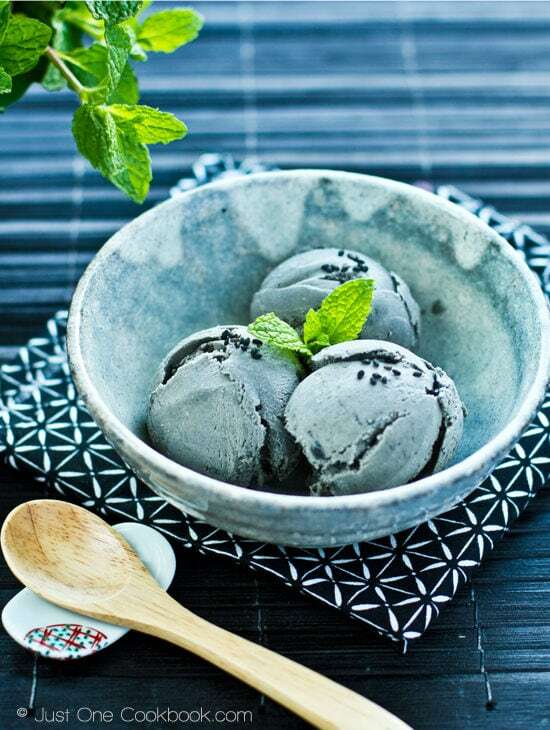 You are right – the addition of the shoyu made a huge impact on the flavor! Hi Norman! 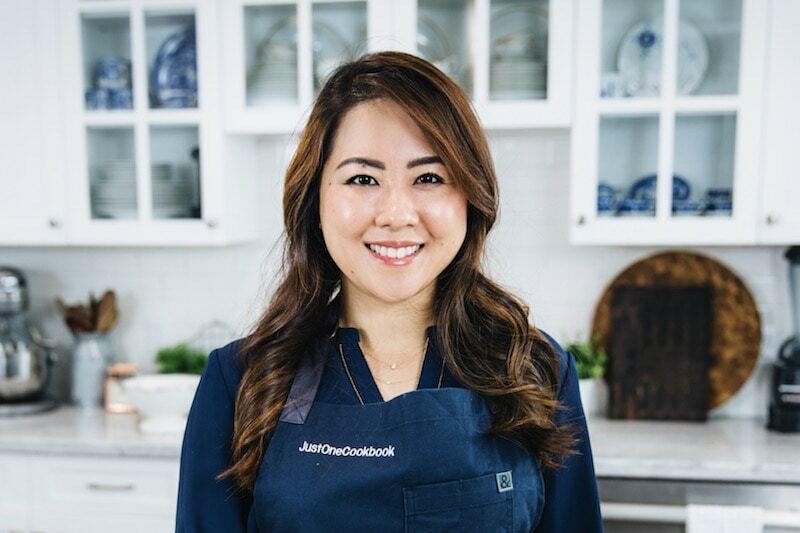 Thank you so much for trying my recipes and cooking Japanese food! I’m so happy you liked this pasta! Yes, shoyu adds fantastic umami – it’s a great secret seasoning! Why do you recommend kosher salt in your recipes involving pork? Hi Peter! I’m not sure where you live, but here in the US, kosher salt (or sea salt) is a standard salt in most recipes (even though you’re not kosher). It’s basically pure salt you get, which is great for cooking. However, if I don’t write “kosher salt” and just write “salt”, some recipe users who use table salt as their cooking salt may put too much salt in the food. Therefore, we always specify what type of salt it is. If you use table salt, you need to cut down of the salt in half. Hope this makes sense. Kosher in regards to salt, means curing salt, or a pure salt like sea salt. Great looking recipe that I will test out and return for a review. Your Enoki mushrooms look a lot like Buna-shimeji mushrooms in step 4 of the photos. Hi Lee! Ah! Thanks for catching my error. 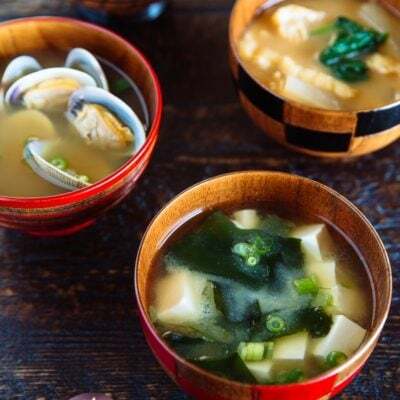 This post was originally published in 2011 with shiitake and enoki mushrooms but I used shimeji mushrooms for better texture for this updated post. Thank you!